Printer, Newhaven and Seaford. Peter Rankin was born at Kilsyth in Stirlingshire in 1857 and was the son of Alexander Rankin, a stationer. On March 29, 1889, he married Isabella Kay Roy at Deptford Parish Church in Kent. He was still living in Kilsyth when he married, and had become a printer. Isabella, who lived in Deptford High Street, was the daughter of Gabriel Roy, a jeweller. After the marriage, she evidently travelled back with her husband to Kilsyth. The 1891 census records that she and Peter were living at 14 Main Street in Kilsyth with their infant son, Alexander (Alex), who had been born in the town in 1890. According to the census, she had been born in about 1860 at Helensburgh in Dunbartonshire. Why Peter Rankin decided to leave Scotland and settle with his family in Sussex is unknown. He is not listed in Kelly's 1899 Sussex Directory, but by 1901 he was living at 29 Lewes Road, Newhaven, with Isabella and Alexander, and working as a self-employed letterpress printer at 8 Bridge Street. By 1905 he and his wife and son had moved to Glenfield in Claremont Road in Seaford, where he set up a printing office, though he continued to work as a printer at Bridge Street in Newhaven. For many years Peter Rankin printed the local newspaper, the Newhaven Chronicle, and was an agent for the Sussex Agricultural Express. He took up postcard publishing soon after divided backs were introduced. One of his early ventures was a black and white halftone card of the 1903-4 Newhaven Football Club team, marked "Rankin Printer, Newhaven" on the back. Another black and white halftone of the Signal Station at Newhaven Harbour was on sale by the summer of 1904. The title is printed in "gothic-style" lettering and the card is labelled "Rankin's Series, Newhaven" on the back. By 1906 Rankin began publishing a series of rather poor quality sepia-tinted collotypes of Newhaven and Seaford, which he may have printed himself. The pictures have white, printed captions and a somewhat dingy appearance. The cards are labelled on the back "Rankin. Publisher, Newhaven and Seaford". Rankin was also responsible for a variety of other halftones and collotype cards of Newhaven, which need further study. More popular with collectors are Rankin's coloured cards of Newhaven. These originated from three different suppliers, but they all have red, printed captions. The new turbine steamer "Brighton" featured on a coloured halftone, which was on sale by February 1905. Marked "P. C. Rankin, Newhaven" on the back, it was published in the "Jarrolds' Series". 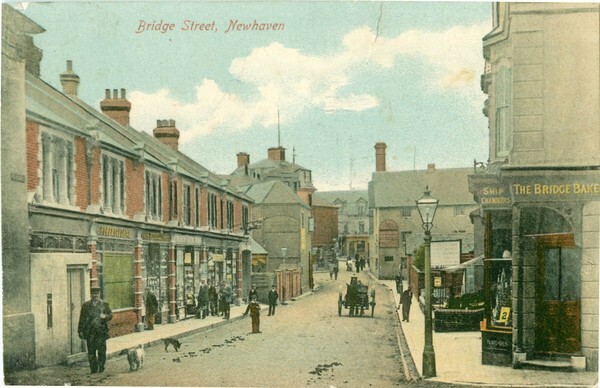 Whether there were companion cards of Newhaven in this series has not been established. Much better known are Rankin's coloured collotypes of Newhaven with italicised captions, which were on sale by 1906. These were printed for him in Germany by Max Ettlinger & Co. of London as part of their "Royal Series", but are labelled "Rankin's Series, Newhaven" on the back. A superficially similar set of coloured halftones with curiously marbled surfaces (visible under X10 magnification in a strong light) were printed by Raphael Tuck in Holland in their RTD Artists Series. These too were labelled "Rankin's Series, Newhaven" on the back and first appeared in 1906. Rankin presumably supplied Tuck with the photographs because at least one was later re-issued by his son, Alex Rankin, as a real photographic card. Rankin also sold coloured cards, possibly chromo-lithographs, showing the coats of arms of both Newhaven and Seaford, and a third displaying a Chyngton badge or medallion. These were on sale by 1908, and have Rankin's name on the back. Rankin's skills as a colour printer are demonstrated by his trade card (shown in the Gallery), which was probably issued shortly before the First World War as Rankin gives prominence to the fact that it was printed in Seaford, not Germany! The card was printed in four workings using at least one normal type of halftone screen and others creating minute ring structures. The result is a pleasing mix of tones and colours, crude by modern standards, but sophisticated for its time. The Rankin family are listed at 8 Bridge Street, Newhaven in the 1911 census, and not at Seaford. Both Isabella and Alexander are listed as helping with the business. Pike's 1914-15 Lewes, Newhaven & Seaford Directory and Kelly's 1915 Sussex Directory make no mention of Peter and Alex Rankin, which suggests that the family had left Sussex, perhaps to move back to Scotland.